After moving in to our new house which was twice as big as our old house, I found that I had all the lovely Christmas decorations that I’d always had, but with twice the vacant space surrounding each piece. I know that it was a good problem to have: tons more room in my home for sleeping, cooking, eating and living. But as far as my Christmas decorations went, all this extra space was no good. Sparsely populating the house my decorations looked pathetic (and a little desparate). 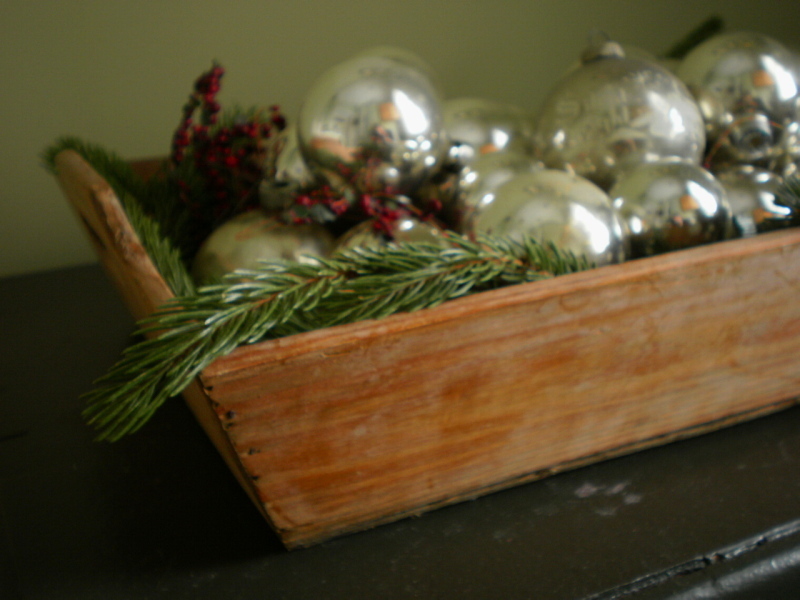 With garage sale season still months away, I needed to scheme up some decorating “quick fixes”: some cheap ways to beef up my Christmas decorations so they looked merry and bright (not lonely and semi-suicidal). So with pioneer-girl spirit, I took my kitchen scissors, traipsed across the front lawn, and cut boughs off my neighbor’s pine tree. 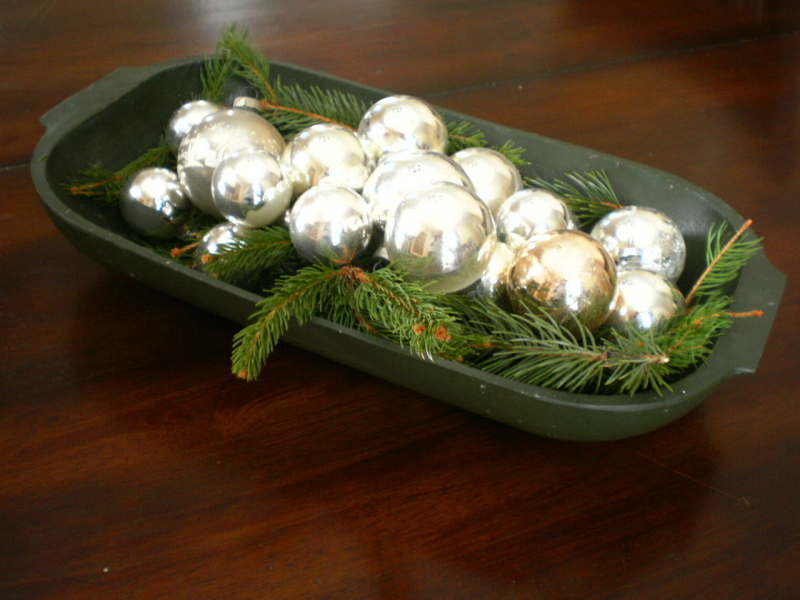 * Using all my favorite containers for decorating (wooden bread bowls, cake stands, iced tea jugs, and basket trays) I tossed in the boughs and topped them with vintage silver glass Christmas ornaments. 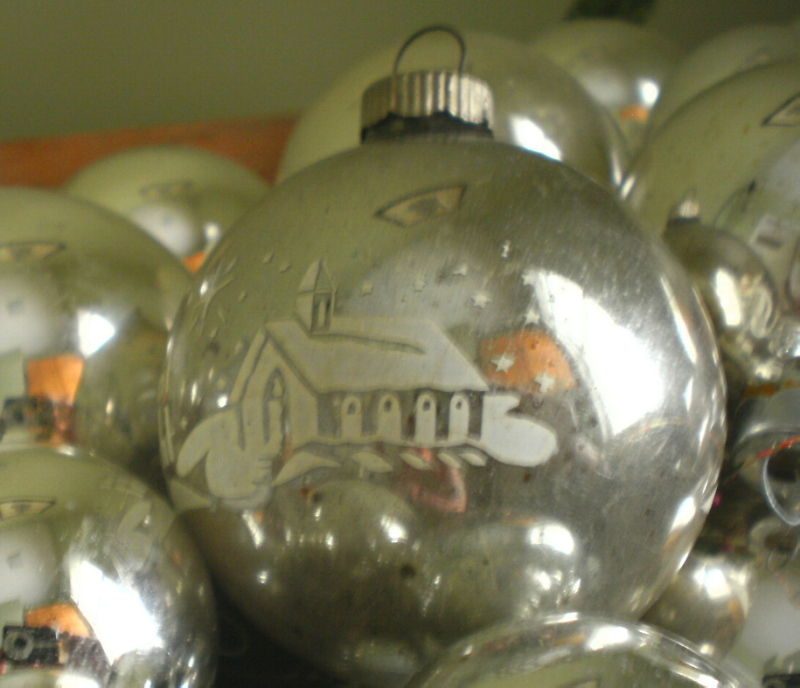 Full sets of brand-new silver glass ornaments are available for cheap at garage sales and after-Christmas clearance sales. And vintage Shiny Brites (with their effortless patina) add depth and interest to this collection. Even though I am slowly and steadily filling up my Christmas home with decorations, I find this free decoration to be one of my favorites. Fresh greenery is timeless and the bright ornaments just gleam (especially in candlelight!). And these borrowed boughs always guilt me into giving an extra nice Christmas treat to the neighbors. They’re so generous to give me such pretty greenery year after year. *Now I’m not going to tell you how to live your life, but I think it very wise to look at the neighbor’s pine trees when buying your next house. You can always replace aluminum siding on your own home, but you can’t force the neighbors to plant pretty pine trees that will supply decorations for your gracious Christmas home. I think when you use something fresh with anthing vintage it always looks nice. My mother used to make each of us a spray of fresn fir to hang on our door. Always smells nice. Isn’t that the most beautiful idea! Your mother is brilliant – something so beautiful (and seasonal and special) would have put me over the moon when I was a girl. I think it still would. Can I please borrow her idea? Great pine tree neighbouring advice! I hope my neighbors never read this. But really, it IS the season of giving . . .